Everyone seemed to like the idea that Ofnir the Black Wyrm, a legendary dragon of the Middarmark, destroyed the southern tollgate about 300 years ago. I really dig that idea myself, and I think I want to take it a step further: I think the Bjornings erected a shrine to Bjorngrim the Dragonslayer1See Bjorngrim the Dragonslayer, Middarmark, page 36 on the spot sometime after his death. The shrine could be largely forgotten and neglected now, though some members of his cult pass by it on occasion and leave offerings. His cult is tiny and not very well respected, since it largely consists of adventurers and other undesirables. Bjorngrim is only revered by Bjornings, though dwarves remember him and tend to respect members of his cult. The shrine and the cult could be an opportunity for an interesting twist. What do you think? Ideas? What eerie development would make your skin crawl? It’s also possible that the Bjorning clerics and paladins of Jernkloster2See Jernkloster, Middarmark, page 26 have a connection to the shrine — their primary purpose is to contain the monsters of the Ironwold3See The Ironwold, Middarmark, page 18, which would make the tragic Immortal of monster-slaying and lost causes appealing to them. The raider cleric could well be one of their number. Do you like that idea? If so, how might we use it? Or should we keep the Cult of the Dragonslayer as something completely separate from the raiders? Visually, parts of the ruined tower and surrounding stone are scored and blackened by the attack, some of it has even run like butter allowed to soften too long by the hearth. Perhaps the shrine contains some relics from the long-ago battle: some dragon scales, a few slivers of the weapon that shattered in Bjorngrim’s hand as he drove away the wyrm? Perhaps that event is what precipitated Bjorngrim’s adventure to seek the Forge at the Heart of the World and treat with the dwarves to craft a weapon that would allow him to face Ofnir the Great for once and all4See Teineigin, Middarmark, page 83? Maybe a sliver of the weapon could act like a relic, providing a gear bonus to an invocation like Evocation of the Lords of Battle (assuming a PC is willing to plunder the shrine for it)? What do you think? What weapon shattered in Bjorngrim’s hand? What other details of the event might the players discover? One of the things we’ve been going back and forth about is how the secret entrance to the Nykr’s prison might work. You provided some good suggestions around hidden hand-/footholds on the outside of the middle tower that lead to a trapdoor, but two suggestions really struck my fancy: A magic rune hidden behind a brick in the fireplace that teleports the party, and a mouse hole in the tower foundation that is actually a keyhole to unlock a hidden door. Those gave me a fairy tale vibe, which I really like to incorporate as a spice when things are set in the Middarmark. What do you think about a mouse hole somewhere in the tower that, should a character kneel before it and peer in, transforms a character into a mouse? The mouse could then scurry down a tiny tunnel hidden in the tower wall to the prison? Do you like that idea or hate it? Would you elaborate on it? Do you prefer something more mundane? How do the raiders cross the river, given the broken bridge? It seems like we’re leaning toward the idea that they use a boat. I’m on board (sorry) but that makes me think about the nykr5See Nykr, Middarmark, page 88 and why it’s trapped. The nykr is a water spirit that appears in lots of Germanic folktales and fairy tales under a variety of names: neck, nixie, nocken and lots of others besides (in Beowulf they are referred to as ‘nicor’). The Rhinemaidens from Richard Wagner’s Der Ring des Nibelungen are nixen, a type of female nykr from German myth. Nykr are known to delight in luring people to their deaths by drowning, though some among them are not malevolent, taking their joy in enchanting any and all with sweet music. Some would agree to go to live with a woman that fell in love with them, but they would usually pine for their watery homes. There’s an old Swedish story about a poor fisherman who had a beautiful, young daughter. One day he met a nykr who promised him bountiful catches if the daughter was given to the nykr as a bride on her 18th birthday. The fisherman agreed, but when the girl turned 18 and the nykr brought her to his house below the waters, she stabbed herself in the heart rather than give herself to him. The story says that’s why some water lilies are blood red. There are other stories that say that if properly approached, and if the right sort of offering is sacrificed (drops of blood, a black animal, liquor, tobacco, etc. ), a nykr will teach a supplicant how to play enchanting music. Perhaps it could teach a magician or ranger the Celestial Music spell? Why is the nykr trapped below the bridge? Some of you have suggested that the spirit isn’t entirely trapped. What if the ancient builders of the bridge wanted it to lure people attempting to cross the river to their deaths? What if they intended for the bridge itself to be the only safe way of crossing? That, of course, would make it impossible for the raiders to cross the river using a boat, unless there’s some sort of trick to it? Maybe they have some sort of item that wards them against malicious spirits? Or they have the nykr’s lyre, and playing it calms the spirit and allows them to cross without succumbing to its siren song? Would that mean that the raiders actually are aware of the nykr and have come to an arrangement, or would there be another explanation for the lyre? Maybe they just stuff wax in their ears? Something else? What do you think? One of you suggested that the river is haunted by the spirits of those lured to their deaths by the nykr. Should we incorporate that and if so how? Also, do you think the spirit was always malevolent? Does it like luring people to their deaths? Or was it once a friendly spirit that has been driven mad by centuries of imprisonment? How was it imprisoned? What keeps it trapped? What might the PCs do to free it, should they be so inclined? If the PCs do it free it, how do things change? Does the river become more dangerous? Or, if the spirit was originally friendly, does the river become less dangerous? If the latter, would that make it easier for the Gotts to cross the river and attack Vargstrond? Don’t be shy! Jump in with your ideas, even if it’s only to answer a single question. Every little bit helps! 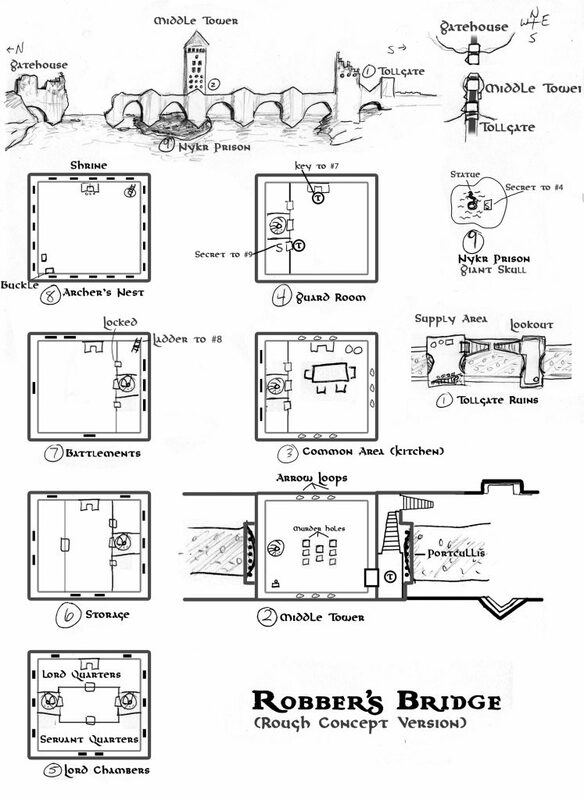 This entry was posted in Adventures, Middarmark and tagged Adventure Design, Prep, Robber's Bridge by Thor Olavsrud. Bookmark the permalink. Regarding the nykr, what if the Saxaling Clan’s buckle that was stolen is the key to controlling the nykr? Perhaps the Saxaling ættir built it from the enchanted gold originally used to trap the nykr, and now the wearer of the buckle holds some type of dominion over the creature, or some treaty was struck between the nykr and the Saxalings and the wearer of the buckle is recognized by the nykr as an ally. In terms of the shrine, I like the idea that the Jernkloster clerics, now that they are stretched too thin, are looking to Bjorngrim the Dragonslayer for aid in their lost cause. The cleric has tried to commune with Bjorngrim through the shrine to learn the location of a lost artifact to stem the tide of monsters spilling out from the Ironwold, but not being a true member of the Cult of the Dragonslayer the cleric has been unsuccessful. Perhaps a member of the Cult from among the party would have more success, and could gain a lead for a later adventure from Bjorngrim with a successful Ritualist test. Tying the buckle into the nykr is an interesting idea, but there is one problem: The Saxalings are a Gott clan. They only took power after the Gotts conquered these lands roughly 20 years ago. The bridge and the trapped nykr, on the other hand, are ancient. If we want to go that direction, we need to come up with some background on how the buckle became part of the Saxaling regalia. Did it originally belong to a Bjorning clan or Græling clan that lived here before the conquest? Does one or more of the raiders have a clan tie to that buckle? If so, is that tie secret or known to the rest of the raiders? Is there another explanation entirely? This is an valid point, and D. Koch provides a great idea I think to get around this below. I also like the idea of the buckle being made from the material originally used to capture and imprison the nykr. But then, this begs a series of other questions: what was this material? How did the Gotts discover its existence and purpose? What remains of the rest of it, and where is it? Why were the Gotts able to find it and no one else? I’m not sure if any of this is fodder for leads for a spin off adventure afterwards, or simply too much to work through. I think we can make Art’s idea of the buckle and the Nykr work. What if the current Saxaling clan actually is a Saaki bloodline? Long ago, when the Saaki explored the seas, before the Saaki arrived at the Middarmark, a Saaki named Ulla married into a Gott clan in the far-off Gottland. Ordinarily, this would not be a problem, as there is some fluidity between the tribes. Ulla joined the Saxaling clan and the Gott tribe, and all was well for a time. However, as it turns out, Ulla the Determined, daughter of Jalo, son of Seppo the Wise, refused to die and sought a way to live eternally. She used her magic to extend her life by destroying the Saxaling aettir in a ceremony to unnaturally extend her own life. With the clan weakened, she brought a curse upon the Saxaling clan. In time, this curse thinned the numbers of the clan until as that remained were Ulla’s descendants. So, there was a switch-a-roo where what we know as the Saxaling are really Ulla’s ancestors. This is the secret that the Saxalings are trying to keep under wraps and another motivation to get the buckle back. This river crossing has always been dangerous and risky. Long ago, before the time of men, a water spirit watched over the waterway. The spirit took no interest in the musings of the First Born. Then, along came the dwarfs and men. The river ran red with the lifeblood of war. The spirit became bitter and malevolent and sided with the Jötnar seeking vengeance for the death of their father, Aurgelmir. The shapeshifting spirit took the form of a horse and would make itself available to those seeking safe passage across the fast currents of the river. Once an unwitting victim was on its back, the spirit would plunge into the depths of the river. Many years later, Ulla, now a horrid witch, made a deal with the nykr to sink the boats of the Bjornings and drown their armies. The spirits could be fallen Saaki spirits, felled during the time of Ofnir’s assault. Because of their curse, their ancestors do not await for them at the Hidden Hall, and so they wander the Middarmark in agony. Ulla’s magic could still linger in this area. As the Bjorning finally defeated the Saaki and drove them into hiding. Ulla returned to the river and sought safe passage. The Bjorning hunted Ulla down to destroy her. They discovered the nykr as well. Feeling betrayed, the nykr turned Ulla into a mouse as a punishment for not keeping her end of the bargain. The Bjornings then sought to banished the nykr. However, something went wrong with the ritual. Instead of returning the nykr to the Otherworld, the spirit turned to stone, forever bound to this world. The mousehole could actually pierce the thin veil into the Otherworld. The party would have to traverse a short passage through another Realm to reach the Giant Skull. As a different idea, what if the background was about lovers from the Bjorning and Gott tribes? There would be the theme of crossing lines, boundaries, etc. We could carry that into the fairytale about a horse and mouse.